Enormous flocks of people gathered to be part of the historic Women’s March in Washington, D.C. Marches from cities all over the country and around the world were held. The prognosticators were knocked off their highfaluting expert status when they learned of the numbers of women and men who attended. I was proud of all those who went out of their way to take part. If I had such good feelings, why didn’t I show that I believe in the march and put my feet together, join the marchers and support their causes? Why did I choose not to attend? The answer to that question originates from a traumatic experience I had many years ago. I was a teenager in Queens, New York. Word got around about a big rock concert that was to be held at the Apollo Theater in Harlem. The most popular performers in the country would be participating for one day. who was to become the husband of Debbie Reynolds and father of Carrie Fisher, was to perform that day. I’ve heard of True Love, but I suffered with True Crush. And a powerful teen aged crush was nothing to scoff at. Remember that Romeo and Juliet were teen agers and you know what happened to them!. At the time Eddie Fisher had his own television show on NBC. He would sometimes take a break at the NBC commissary. One day I was at the commissary and saw him at a table across the room. My shy, insecure teen aged self was outvoted by the teen in love persona, as I boldly propelled my body from my seat and strode over to his table. There was a line of admirers by the time I reached my goal, asking for autographs. When I approached Eddie, he looked me straight in the eye, reached for a photograph of himself and wrote, “How do You Speak to an Angel.” Doesn’t that give you butterflies? But he was merely writing the name of his latest record, not complimenting me! So now I was going to a show in New York for another chance to see him. I was in heaven! But when my friends and I got to the theater we were confronted with crowds larger than I had ever seen. Teens were swarming around the entrance door, pushing and screaming in their frenzy to be admitted into the theater. A strange sound entered the fray; dozens of horse hoofs resounded on the pavement. Suddenly a group of policemen on horseback approached the theater threateningly, toward the large group of teens. They kept maneuvering the horses closer and closer to the long, cheering line of us until there was no room to move, no chance to get out of the crowd, no way to escape the mobs of fans. We were herded off the street and closer to the building. It was the most frightening feeling I had ever known; total helplessness in the wake of those powerful animals and pulsing bodies pushing against us. I couldn’t move or run. I was engulfed and paralyzed in the middle of the swarm: as helpless as a little bug trapped in dripping of sap from a tree. When all the bedlam ended I eventually gained entry to the theater with my friends, still shaking from the experience of being almost crushed by the surging wall of teenagers desperate to see the show. I have avoided crowds ever since that day. And I will continue to avoid them unless Eddie Fisher is resurrected and is ready to sing for us once more. Maybe this question wouldn’t occur to me if I didn’t live close enough to New York to occasionally bump into a famous face. I saw Chris Rock at an art gallery with an agent, looking for artworks to buy. I saw Robert Duvall standing next to me crossing a street in Manhattan. Adam Arkin just strolling and chatting with a buddy after a matinee performance. There was Geoffrey Holder paying his check at Balthazaar restaurant. And Don Johnson having lunch at the restaurant as we were. I saw Cher in the audience of a small off-Broadway production, calmly waiting for the rest of the audience to exit the theater. When I was a teen-ager I had a crush on the singer Eddie Fisher. One day a group of friends and I went into the city to see his TV show, after which we had snacks in the cafe downstairs from the NBC TV studio. Eddie was sitting at a table, with lines of teenaged girls waiting for his autograph. How could I resist? So I joined the line, and when my turn came he looked at me, took a large photograph of himself, wrote something on it, and handed it to me. When I stopped shaking long enough to read what he wrote, I saw, “How Do You Speak to an Angel?” That was the name of his latest hit song. 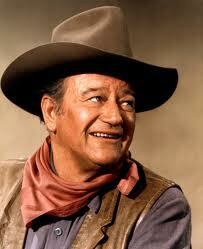 The biggest star I ever saw close up and personal was John Wayne. We were in a small toy store and he was shopping, just as I was. There was no mistaking him: He was huge! I don’t know what I should have said, but I still think that standing face to face with someone you recognize should elicit something. But what? So be careful; if you pay attention to a famous person you might get stuck paying for their dinner!